DROOL: I wish we could have gone to Stanford together, Leo. MICROPHONE: I haven’t thought about you in years. DROOL: We could’ve spiked our Who’s Most Pedantic with courses on phenomonlogy, econometrics, non-retrogradable rhythms. MICROPHINE: Only what end continues, pig. DROOL: I would’ve been happier staying in Guayaquil with you and arguing with you about everything. MICROPHONE: Yet another half truth. DROOL: I’m sorry Leo I . . . MICROPHONE: You really think you have to confess all this to me? DROOL: Everything’s implicit and not implicit. MICROPHONE: Do you feel better now? MICROPHONE: How many times do you have to re-imagine a heart-felt reunion until it replaces the memory of our paltry reunion? 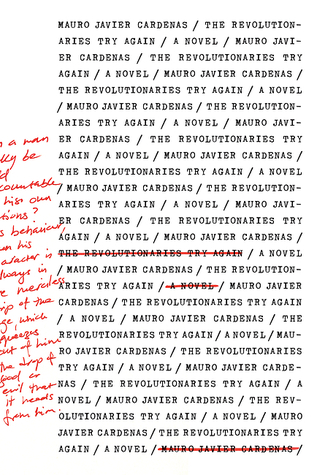 The attempt to write a review of Mauro Javier Cardenas’ debut novel, The Revolutionaries Try Again, in the aftermath of Donald Trump’s election as President of the United States, finds me a little at a loss for words. Fortunately, Cardenas is never at a loss for words. Words tumble forth, careen across the page, distort the lines between English and Spanish, (falling entirely into Spanish for two short chapters extolling, if titles be trusted, grandmotherly advice), and, sometimes, sometimes he offers snatches of dialogue, scripted even. This is a multi-voiced celebration of language, capturing in its best moments, the complicated mess of thoughts, emotions, and memories that course through the minds of his protagonists. The beating heart of The Revolutionaries lies in nostalgia for the idealism of youth, and the loss of faith in one’s ability to be a force for change. It is, essentially, about growing up, and the inevitable sadness that entails. Yet old dreams, it seems, die more readily for those who have the least to lose; whereas they crumble in agony for those who have little to begin with, and thus the most to lose. I drink so I can bear talking to people, Antonio wrote. I acknowledge my conversational alcoholism. The more people converse with me, the more alcohol I am bound to imbibe. My liver, that most handsome of organs, was heard gossiping to my other organs about the absurdity of my social neurosis. Thank god my kidneys stood up for me and said shut up liver, you’re drunk again. When his childhood friend Leopoldo calls him from Ecuador to report that there has been a coup and suggest that perhaps it is finally time for them to have a horse in the political game, Antonio heads home after twelve years away. What unfolds, more than productive action moving forward, is a replay of past memories, mediated by banter between the two friends, and featuring cameo appearances by other members of their former social group. They fall into using old nicknames, and rekindle past glories and grievances. Behind it all is a deep nostalgia for a time in their lives when their faith was grounded in a belief that they could make a difference in the world. As adolescents, under the guidance and inspiration of their beloved Father Villalba, the boys would visit the ill and catechize to the poor—they harboured a sense of being chosen, and Antonio even dreamed of becoming a priest for a while. A third friend whose story plays out against those of Antonio and Leopoldo, is Rolando. He had not enjoyed the same relative financial advantages as the others, and together with his girlfriend Eva, he is struggling to broadcast a little reactionary radio program for better or worse. Their concerns are more immediate, the risks they take are greater, and even if the effect is small, they are actually trying to do something. But their relationship is complicated by unspoken losses—Rolando’s sister’s escape to America and Eva’s brother’s disappearance and death. This is a novel that is looking back and stumbling forward at once. Little progress is made. That is the point and that is not the point. The realities of Ecuador’s political and economic uncertainties are an ever present backdrop, one that steps forth with particular brutality toward the end in the stories of the two female characters. But all of the main male characters seem to be mired in their own pasts, for all their vain talk of revolution. What rises to the surface is a profoundly human blend of nostalgia, loss, guilt, casual racism, sexism, and masculine insecurity. But there is also humour. This book is a startlingly infectious read. Ladies that’s the perfect segue to our contest about what would you like to call our interim president?—Puppet of the oligarchy—Very nice Doña Aurora—Pompous pajorreal—We’re warming up folks—Bestia con terno—Keep them coming comrades—Radio Nuevo Día / la radio al día—Up next how to cook a seco de chivo without the chivo—Baah—Speaking of chivos—El Loco is said to be returning from exile in Panamá—Who’s voting for that thief?—If you tell me you’re voting for Loco I’ll go loco—Has anyone seen the mansion of this leader of the poor?—Call now! By engaging a range of narrative voices—at the personal and the socio-political level—visions of romantic idealism meet the harsh realities of class division. The shifts in perspective and energy keep The Revolutionaries Try Again moving at sharp pace, yet for all the sensation of being in freefall, Cardenas’ novel is, in fact, a tightly orchestrated achievement. In an interview published at Electric Lit, Cardenas shares a spreadsheet tracking the characters, conversations and narrative styles employed in one scene of the book. And this attention to detail at the formative level is what makes this cacophonous work succeed. Transitions between monologue and dialogue, present and past, are so smoothly handled that the reader is swept along with the sheer literary enthusiasm. But make no mistake, this is a novel that is as enjoyable to read as it is fundamentally melancholy and devastating at its very core. The Revolutionaries Try Again is published by Coffee House Press. I know it’s not for everyone but it much easier to read than it sounds. I think the fact that he had it so carefully mapped out to ensure internal consistency makes all the difference . The main characters are so human and sympathetic too, and that’s important. He spent years writing this. The toughest thing for me was keeping the supporting cast with their nicknames straight. I had wanted to read this for a while, ever since I saw the great cover, but to be honest I was surprised when I opened it and saw so many styles of narrative and all the Spanish. I bought it the day I started an online copy editing course where conventional grammar and sentence structure was the order of the day! Quite the contrast. Sounds intriguing, if challenging – but sometimes we do need those challenging reads in our lives. Oh I like the sound of this one, all those different narrative techniques are intriguing. Plus it is published by Coffee House a great indie press in my city! This sounds a little painful at the moment, when ideas of progress are being crushed across the planet. I’d like to read it but I worry its melancholy will prove too devastating! Do you know why some passages are still in Spanish in what is presumably the English translation? It’s not a translation. I thought it was for the longest time, but it intentionally straddles the languages. As an uni-lingual English reader I did not worry I was missing anything and it gives the book a great feel. It is an interesting book to read at this time, the allusions to extent of American interference in Latin America over the years, and the fact that the main character, Antonio, is an expat. But essentially it is a book about the lost idealism of youth. The complexities of the political parallels are telling though.